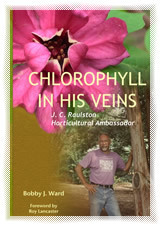 J. C. Raulston was the most important and influential figure in American horticulture in the latter part of the twentieth century. His passion for promoting new plants for landscapes was unmatched. As a teacher at Texas A&M and at North Carolina State University, he gave generously of his time to students, profoundly influencing their lives, altering career paths and personal directions. He saw potential in both plants and students. Against many obstacles, he succeeded in establishing the North Carolina State University Arboretum that now bears his name. Chlorophyll in His Veins is an intimate biography, celebrating the life and accomplishments of one of the most-loved gardening personalities. "Finally, the inspirational story of this century's most important horticulturist can be told. Bobby Ward's well-researched chronological biography weaves J. C.'s life-long diary entries with outside perspectives in detailing J. C.'s lifelong passion for learning about plants, his desire to share with others, and the against-all-odds stories that shaped his life. Even those who knew J. C. for decades will be surprised to learn the "rest of the story" of the man who shaped so many gardening lives . . . a truly fascinating read." "Countless gardeners and nursery owners benefited from J. C. Raulston's extensive travels in his search for new and worthy plants. Two rare mahonias in my own garden, Mahonia chochoca and M. lanceolata, testify to his generosity. This book is a celebration of the life and accomplishments of one of the most-loved personalities the gardening world has known." " Still to this day, after so many years passed, hardly a day passes without being reminded of J. C. There will be a plant encountered in the garden that he gave me, or mention of a book or film or something in the kitchen that brings him back briefly, fondly remembered. Though, like many others, I felt I knew J. C. as a friend and mentor while accepting the complex texture of his personality, Bobby Ward's biography on this giant of American horticulture makes me realize, in truth, how little I knew of his life. He has written a highly readable and intimate biography that ensures the legacy of this man will continue unchecked into the future. As we owe J. C. Raulston an enormous debt of gratitude for what he proffered the horticultural community of North America, a certain ration of thanks should also be reserved for Bobby Ward for guiding this project through to a befitting conclusion. " "J. C. Raulston, a professor of horticulture at North Carolina State University and founder of the arboretum now named in his memory, was arguably the most important and influential figure on the American gardening scene during the last half of the twentieth century. The number of uncommon but highly desirable plants for both the residential and the commercial landscape is unmatched. It is everyone's good fortune that in Bobby Ward's biographical assessment of his life and works Raulston's significance is assayed with both wit and accuracy. Readers who are familiar with the academic scene and its often petty politics will be fascinated by this book's treatment of the history of Raulston's arboretum." "In all pursuits, there are those individuals who excel beyond reason, who set the standard so high we ultimately deify them: in North American horticulture, names like Meehan, Sargent, Bailey, Wilson, Wyman, Creech, Dirr, and Raulston. For those of us who knew J. C. Raulston--the countless students, his colleagues or dear friends--this book begins to connect the dots, making the person we know as J. C. more real, more human, and even more inspiring. " "The late great J. C. Raulston was a man for all seasons in and out of the garden. His prodigious energy for work, travel, books, students, and friends was legendary, and with this biography those who knew him-and those who didn't-will be awed by the way an Oklahoma farm boy overcame many obstacles, including his own self-doubts, to become what The New York Times called 'a generous-spirited giant among horticulturists'. He was troubled, like all people of great talent, living in a troubled world. But his motto, 'Plan and plant for a better world', was a serious, lifelong effort to leave the world better than he found it. He was a North Carolina treasure, whose legacy is the NCSU Arboretum in Raleigh. And his legacy is also legions of friends, among them, new readers like myself. "